Sometime around the brief heyday of Rhode Island skiing, there was talk of building a second state-owned ski area. From the late 1930s to 1965, the state had owned and operated Diamond Hill ski area in Cumberland. Due to financial woes, the state leased out Diamond Hill starting in 1965. Perhaps in part due to difficulties surrounding this operation, the state refused to construct a second ski area. A Buck Hill ski area would have likely had a vertical drop of nearly 200 vertical feet. It is not known what facilities it would have had, however at the time all Rhode Island ski areas were all surface-lift-served. There are no known remains of the Buck Hill ski area development.
" 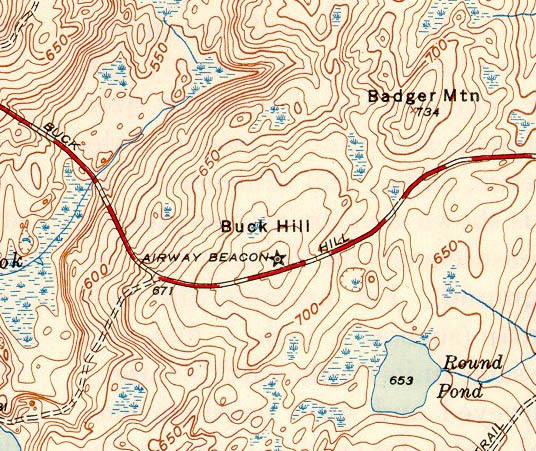 In the '60s, residents of Burrillville lobbied heavily for the state to establish a ski area at Buck Hill, which lies just adjacent to the management area. Partisans were moved to disparage their northeastern rival, Cumberland's Diamond Hill, where there already was a ski area, as "that rock outcropping" and to boast that Buck Hill was 5 to 10 degrees colder than any other spot in the state. Nevertheless, the General Assembly declined five times to put up the money for the project. " "Four Corners in Search of Rhode Island at its Farthermost Points" Providence Journal. 21 May 1989.